With just a day to go in Japan until the release of the Digimon Frontier Blu-ray box, we get a bit more Frontier artwork! This time it's artwork of the Ten Ancient Warriors. The ancient heroes of the digital world in Frontier, their powers were split into the spirits the heroes and villains use throughout the series. The artwork here is from a promotional poster that was made when Digimon Frontier first aired in Hong Kong. Less than a day until the Frontier Blu-ray box is out! This is literally beautiness!! ❤️ They are the ancestors of every other Digimon in the core continuity of Digimon so they deserve some praise. Amazing artwork! I wonder if this one it's also been done by Soh Moriyana, the style is kinda similar. Whoa new poses! Awesome. Those Ancient Warriors needs more screentime. 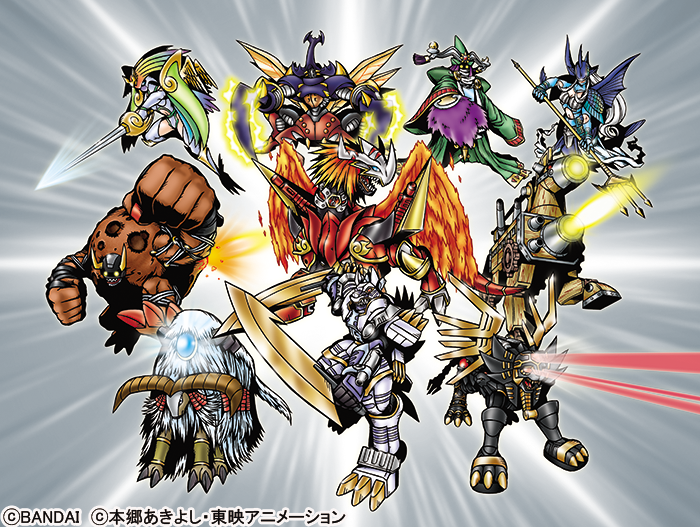 Though I never really liked the whole "humans become Digimon" aspect of Frontier, I loved the 10 Warriors mythology and how it manifested in the various designs. Esp it came form a diff country !! That's true, for instance Susanoomon (All 5 Chosen Children) > Susanoomon (Takuya & Koji). Apart from the fact that the Ten Legendary Warriors are regular megas with similar power to the Fusion Forms. Hence KaiserGreymon & MagnaGarurumon > Warrior Ten, let alone Susanoomon itself.